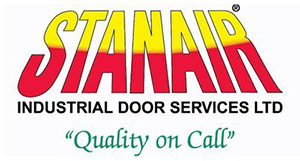 Stanair Industrial Door Services is one of the UK's first specialist industrial door repair companies. When you make an emergency call to Stanair you can expect to have an engineer at your site within two hours of making that call, sometimes sooner backed with a company promise to deliver that service 24/7, 365 days a year. With over 52 vehicles at our disposal all of which are personally contactable, Stanair is able to provide a fast and efficient industrial door repair service across the area in which we operate. Your doors will be repaired to meet all relevant Health, Safety and Welfare standards as well as complying with current Machinery Directive Regulations. Certificate of Conformity/Status Report submitted on completion. 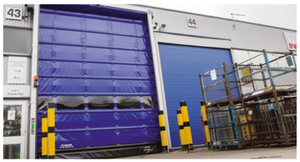 LPS1197 for service and repair to all types of industrial doors. All of the above services are offered for products fitted by Stanair, they are also offered for those supplied and fitted by other industrial door companies. Our engineers are not only highly trained but receive ongoing training to keep up with the current product and safety regulations, so you can be rest assured once your industrial doors have been repaired they will be safe and secure. It was this level of service promise that most appealed to leading Civil Engineering firm, JFC Plastics. Previously they had chosen to use national companies for their door repairs, but found the service offered to be disappointing and response times poor. In contrast, Stanair demonstrated a real understanding of their business whilst delivering speedy response times. Stanair Industrial Door Services offers an extensive range of industrial door products, from sliding doors, dock loading systems, sectional overhead doors, fire resistant doors, roller shutters, aluminium entrance doors, sliding trackless gates, and gates and barriers. Leading Bubble film Producer, Sansetsu, called in Stanair for guidance when their need to increase traffic movements within their flourishing business, led to the recommended installation of a Nergeco Rapid Action Door. Having presented the best option for the job, Stanair then took their customer to a nearby site, where the model type door had been installed for a similar application. Here Sansetsu representatives were able to see the door in action and speak to those on site using the door on a daily basis. Sansetu were exceptionally pleased with the install. Now in our fourth decade, Stanair has established itself as the trusted name in the market for delivering a consistently reliable service to suit the customer. Indeed, our company promise to you is that "we will either secure or repair your door on the first engineers visit or you do not pay a penny”. Stanair is an investor in People Company and is also a is a member of The Door & Hardware Federation (DHF), Automatic door Suppliers Association (ADSA) and is SafeContractor approved. 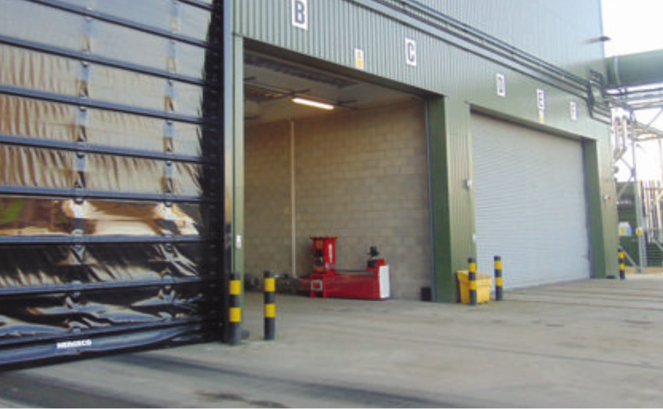 BI Engineering turned to Stanair for a fast-acting industrial door fitted with sensors which automatically activate when a forklift approaches.